Cinemablographer: Villeneuve to Adapt Saramago! I don't know how I missed this story, but Variety reports that director Denis Villeneuve's follow up film to Incendies will be an adaptation of José Saramago's 2002 novel The Double. I read the book this summer and quite enjoyed it. It's about a lonely man named Tertuliano Maximo Afonso who rents a video one day and sees his doppelganger in a small role in the film. Afonso becomes fascinated/disturbed at the sight of himself in another world, so he sifts through an endless range of material on VHS to better learn his double, and his quest eventually leads him to confront the man himself. Jake Gyllenhaal is tapped to star, so one can assume that the leading man will not be named Tertuliano Maximo Afonso. That won't fit on a marquee. It's an odd, if convoluted premise, but, as always, Saramago is a master storyteller and he fills The Double with all sorts of philosophical goodness that seems right up Villeneuve's alley. The director will not be writing the script himself - Spanish screenwriter Javier Gullionwill be penning the adaptation. The film, titled An Enemy, will be a Canada/Spain coproduction, with Canadian producer Niv Fichman overseeing production. 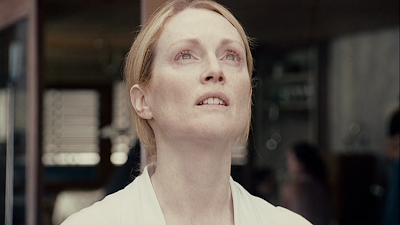 Fichman produced the 2008 film adaptation of Saramago's Blindness (pictured), starring Julianne Moore. Blindness is my favourite book, but I don't think the film was quite on par with the novel. I do, however, look forward to seeing how this one turns out!